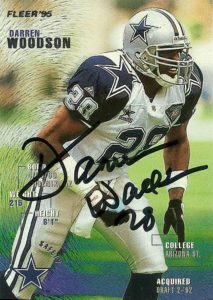 I had gotten Darren Woodson just once at training camp way back at St Edwards in 1992. It was the last year I’d enjoy going to training camps full time during the summer as school, girls, and work took more of priority after High School. Looking back, it was just perfect timing for me to go to camp during those years in the early 90s, as not only was I in that transitional point moving into being a young adult, but also the Cowboys were building their dynasty, multiple great cards were appearing on the market, and players were still relatively eager to sign for free. I always wanted to get Darren’s GameDay 1992 entry signed. The one I had made it back to camp the following years, but it never made it into his hands. 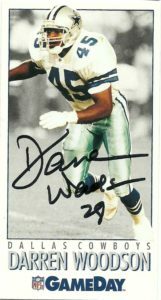 It’s a great rookie card technically- one of the first to picture him in his Cowboys uniform. The other two here, are really just filler from sets that I liked after the fact. Although I liked the gaudyness of the Topps Hitmen cards, I think the luster of Darren’s uniform is lost in all the gloss and metal sheen. The Fleer 1995 was audacious as ProSet 1992 in its design, and as such it was just as disastrous in my mind. The chaotic design which varies per team, really can be a negative on the presentation on the card itself. This one for example breaks multiple design rules. The most annoying among them being Darren’s position listed quarter circling the star. I don’t know what is up with the fingerprint effect either. (It also didn’t help that the Cowboys joined in the ugly trend during the mid-90s of plastering the team logo on the shoulder of the uniform.) Still for many of the rest of the teams in this set outside of the Cowboys and a few outliers, the design is clever and daring with the player information displayed on the front. I had failed previously to get Darren’s autograph back in 2015. I fired out another attempt in 2016 when he started popping up on the scene around Dallas events. I was really surprised to see this back in 11 days flat.